Until the year 2150, humanity assumed to be by themselves in the universe. They longed for like-minded people, whom they could research and get to know. In short, they craved a new challenge and thus, the scientists did not stop searching for extraterrestrial life. After many years’ precipitation and failures, they succeeded in establishing contact with other living beings in the galaxy in 2150. Humanity was overjoyed to have eventually succeeded with the protracted generation-covering search for extraterrestrial life. However, the joy was not meant to be long lasting. Over the course of the following 200 years, humanity was drawn into an intergalactic war by their apparently not quite friendly neighbors. Additionally, the hostile aggressors clearly defined their goals: They want to exterminate humanity. But humanity wouldn’t give up without a fight. 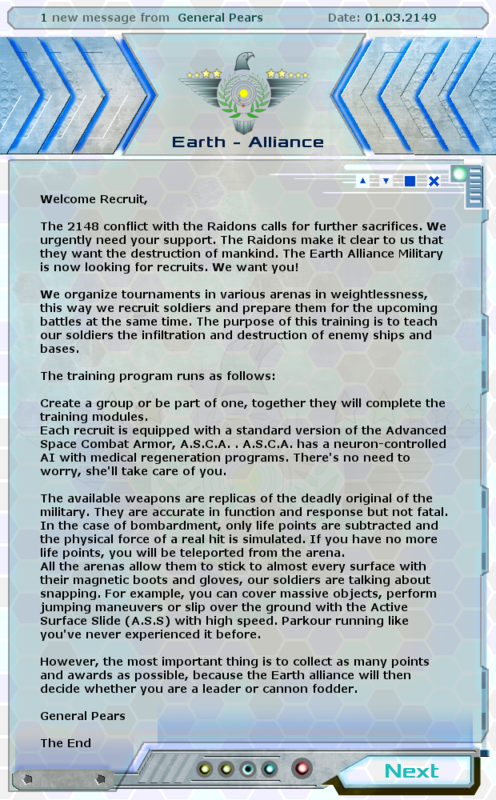 For this reason, the earth alliance decided to use the solar system as a training ground which was the only safe place that they still knew. It was used to arrange tournaments in order to recruit soldiers and to train them as quickly as possible. The goal of the participating units is to infiltrate the stations and ships of the opponents, to find their weak points from the inside out in order to immobilize or even completely destroy them. Slip into a character of your choice, help the earth alliance to protect humanity against the aliens and save your home!